Alhamdulillah! Excellent news. Looking forward to any footage and images! These AWACS will be a true force multiplier for PAF. Dutch translation: Saab sold rather with Erieye equipped apparatuses to among others Thailand. The radar system is also in use in Brazil, Mexico and Greece, where it has been installed in Embraer ERJ-145. Also Pakistan, which receives first Saab 2000 soon, takes the system in use. Translation summary: Saab has sold two Saab 340 AEW (Airborne Early Warning) to UAE during Dubai airshow 2009. Both aircraft have been fitted with Erieye radar system. UAE is going to use both aircraft for border reconnaissance and rescue operations. The sales contract also includes the delivery of spares and ground command and control systems. I guess UAE has followed suit after seeing that PAF aqcuired the Erieye system. DECEMBER 8, 2009 - According to news reports, Pakistan Air Force (PAF) has received first of four Swedish-built Saab 2000 ERIEYE Airborne Early Warning and Control System (AEW&C) aircraft. The aircraft landed at a Pakistani Air Base today (December 8), according to news reports. Remaining three Saab 2000 ERIEYE (AEW&C) will be delivered to PAF in year 2010. Great news, we needed these planes badly. I hope Pakistan Air Force are going to have their Erieyes in the 'Grey Tone' camouflage and not the white livery that the training aircraft has been delivered in. White looks very odd and obvious. ISLAMABAD: The Pakistan Air Force on Tuesday received its first of the four Saab-2000 Airborne Early Warning and Control System (AEWCs) aircraft from Sweden. The aircraft landed at one of the PAF’s main operating bases, marking the achievement of a major milestone in the overall modernisation plan of the PAF. With the induction of Swedish AEWCS, the PAF has become one of the few air forces in the world to have airborne early warning capability. Besides detection of high and medium altitude flying aircraft, this state-of-the-art system is also capable of detecting low-level flying objects over land and sea at extended ranges. The system is capable of picking even surface targets over the sea. By virtue of these features, the PAF would be able to boost its operational capability manifold by achieving requisite early warning for efficient and meaningful air defence of its airspace. Must have made the Indians day when they first heard about it. Wow .. that's funny cause locally this news was not so much popularized. Since they have Pakistani instructors on deputation, it is an excellent opportunity for them to have Pakistani operational backup support + for us in case of sanctions possibility of exchange of know how on the future version of this aircraft. Yeah I know .. I still count ourselve "sanction prone" ! The interior is neither Saab 2000, Fokker F-27, or ATR-72. I mean the lights , over head, and the upper fuselage area. Have we received the Chinese Y-8 aircrafts yet? One is wearing a Rado and the other is wearing an Omega, where is Sobank!! Edited by Felicius, 26 January 2013 - 08:29 PM. 2 ZDKs received, third ZDK will be delivered soon. Edited by Magnus, 27 January 2013 - 09:53 AM. I didn't quite get you there...how isn't it a Saab 2000? 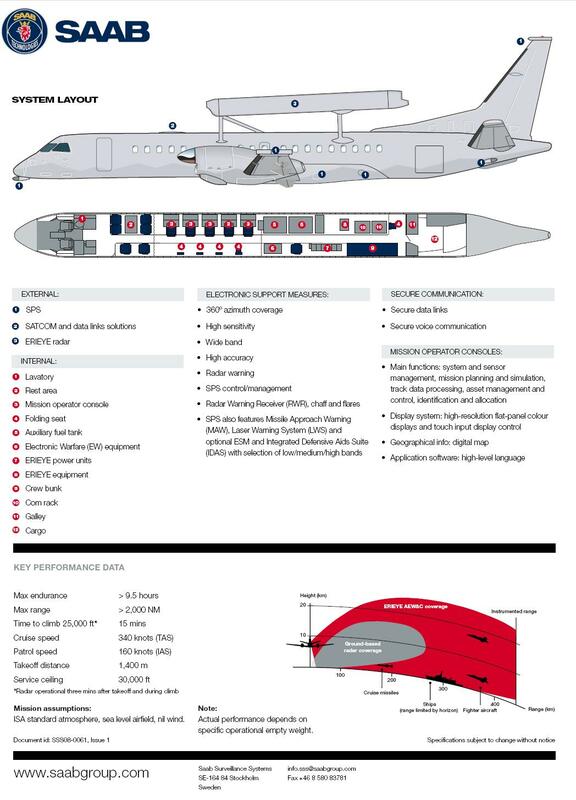 You familiar with the interior of Saab 2000 AWACS? What is so peculiar about the lights, overhead and upper fuselage area? Saab 2000 is originally a passenger aircraft, it's not a Saab from the inside. You can add/remove seats but the over-head reading lights and the upper fuselage areas don't change. Edited by Felicius, 27 January 2013 - 10:37 AM. watch the exercise video posted above. The lights are totally different, not the positioning. means different size cuts and fixtures. To change the interior, you are talking almost double the price of the aircraft. Like asking Toyota to replace all positioning of glove compartments, etc. Everything is doable for sure, just redesigning. Not that simple once the manufacturing assembly has been established. They are going to change injection molding for 5 aircrafts? If they did, then perhaps it was possibly to lower the costs, good for them I say. I know we have Saab's, not denying that. But asking if that particular interior could have been the Chinese aircraft, if I compare the over-head interiors of the image with interior of passenger Saab 2000. Edited by Felicius, 27 January 2013 - 11:31 AM. You guys can compare for yourself ! They look the same to me ! at least the upper panel is same as that of in 3rd pic, click to see in good res ! In the last pic, the over-head certainly does, thanks. I was hoping to see the interior of the Chinese ZDK. The ZDK is a bit more wider and has more cross section...so I think there is a bit more room in it than the Saab, evidently noticeable. And just to make it clear, the overhead bins can be easily replaced. Airlines do that all the time to fix or replace them. They are held onto place by screws and are not a permanent fixture in aircraft. True, only if the overheads fit into place and the fittings match. Provided they have another set of overheads for that aircraft. Do any of Pakistans AWACS (Erieye/chinese one) come with aerial refuelling capability? That would really help increase endurance of these birds. Men who don't understand women fall into two groups. Bachelors and Husbands. Don't need it! However there is provision for it on SAAB-2000. ANy link for that or anything...or is it an inside info??? They were commercial planes before, so I can't really see them having provisions for IFR fueling, especially a probe and drogue system. Actually the Saab Erieye has a modified fuel tank built into the fusesladge, the info is on the net so you can read up on it those who are interested it doesnt need IFR due to that cause it has more than enough station time in the air. I wonder if they have sleep area over there. After 9+ hours of situational awareness these lads must get really tired. It has a crew bunk area, a rest area and a galley. Since Pakistan is the only user of the Saab 2000 Erieye, this picture must be of an aircraft delivered to PAF after SAAB testing of flares.